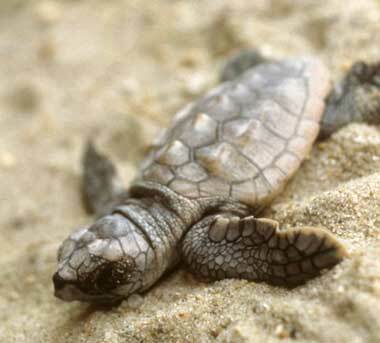 Loggerhead sea turtle hatchling (public domain photo on USFWS Digital Library). The Florida State University School's Middle School Science Honors Class students worked with State Representative Curtis Richardson to include the loggerhead sea turtle in Florida's state symbols. Loggerhead sea turtles are listed as threatened with extinction, partially due to destruction of their nesting habitats.The loggerhead sea turtle's status as official state saltwater reptile will expire in 2018 unless it is renewed. 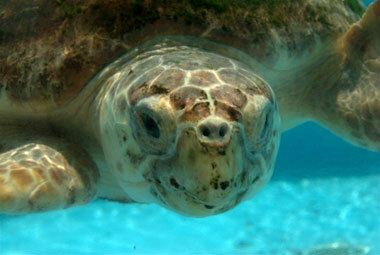 Adult loggerhead sea turtle; photo by Dan Bodenstein on Flickr (noncommercial use permitted with attribution / no derivative works).